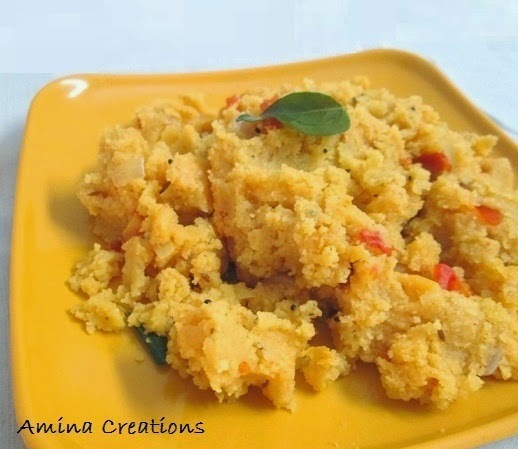 Upma is one of the most commonly prepared breakfast varieties in most south Indian homes. But at home, my mother always prepares upma by adding tomatoes. This adds a nice flavour and taste to the regular upma. Dry roast the sooji for about 5 minutes in a thick bottomed pan and keep ready. Heat oil in a pan, add mustard seeds and allow the seeds to sputter. Add onions, curry leaves, red chillies and asafoetida and saute for a few minutes. Then add cashews and saute till golden. Next add the tomatoes and cook till they turn soft. Now add salt, turmeric powder and water and bring to a boil. Reduce heat and add the sooji slowly, while stirring continuously. Make sure that there are no lumps. Continue cooking and stirring for a few minutes till large boils are seen. Now switch off the gas and close a lid. Allow it to cool down for 10 to 15 minutes and serve warm. Even I do this, I also add some garlic to it, looks really good..